Duration: About 2 hours from Bray to Greystones, 20 mins return by train. 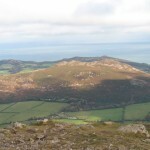 The walk around Bray Head is a real gem. 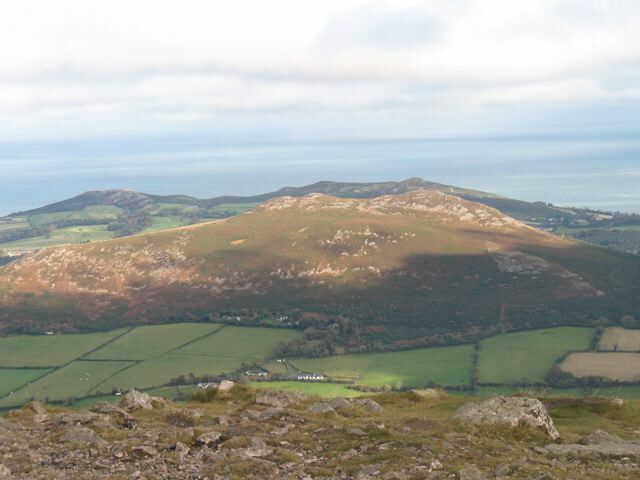 As well as the uninterrupted views out to sea and of the cliff scenery, one of the most appealing aspects of the walk is how quickly the ambience changes from the bustle of Bray town to a quiet that feels a million miles away. 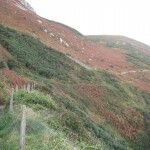 The clear, level path is probably suitable for all ages, although care is needed with young children at some stretches where the path runs close to the cliffs. Although the directions here start from Bray. this route can be walked in either direction i.e. starting either from Bray or Greystones. Start from the Bray Head Hotel, at the southern end of Bray promenade. Although blocked to cars, the road continues south, quickly rising and changing to a footpath. Follow the footpath around the coast. 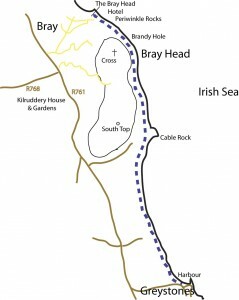 After walking around Bray Head, continue along the path as it skirts Greystones beach. If preferred, it is possible to descend onto the beach at a bridge where the path crosses a river draining into the sea. On reaching Greystones harbour, continue into the town to the railway station. Take one of the frequent trains back to Bray, end enjoy the cliff views once again from the comfort of the train. The station in Bray is about a kilometre or so from the starting point at the Bray Hotel. nice blog. Just thought I’d mention that the cliff walk is officially closed, because of a rock fall recently. It is possible, with a lot of effort and scrambling through brambles, to get around the falen rocks, but, there is another cliff walk, further up, that is well worth doing. The (lower) cliff walk you have outlined in your article is one of my favourite walks in wicklow, but, because of the rock fall I decided to take the (upper) cliff walk today and I forgot how amazing the views are from up there. 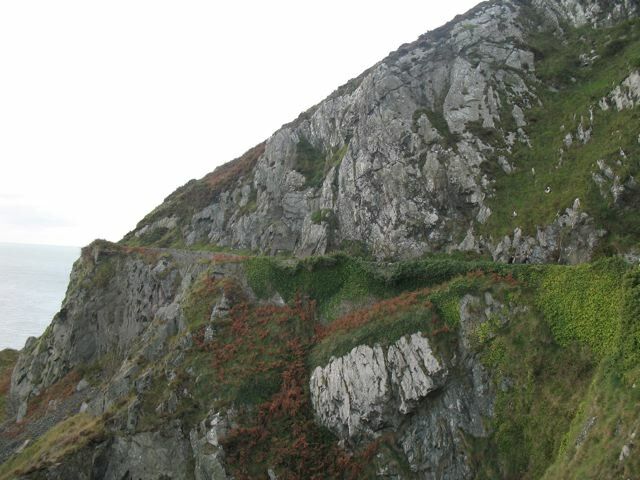 Brief directions for the (upper) cliff walk would be to walk up to the cross on top of Bray head and follow the track behind the cross, until you come to the pointed rock mound (where walkers have placed a rock on what has become very large pile over the years). Leave the track, descend down (it’s a little steep at this point) to the very narrow dirt track that runs beside the rock mound and follow it until you come to a larger path that runs at right angles to the sea. Turn left and descend down the path towards the sea until you come to a gate…once over the gate, you’re on the (lower) cliff walk and you can follow the directions given above. It’s a tougher walk than the (lower) cliff walk, but, the views are incredible. Not suitable for children. The track isn’t walled off like the lower cliff walk and there are some unprtotected steep drops on the sea side of the upper cliff walk that wouldn’t suit children running about. The Cliff walk is now fully reopened. Someone told me that the Cliff walk was interrupted by the work on Greystones harbour. Is it open again? Cliff walk is fully open – just walked it today. Walked from Greystones to Bray last week its a lovely walk on a fine day. Finished off with a coffee upstairs above Cassonni’s chip shop looking out on the sea while I waited for the taxi I booked from braytaxi.com for my return trip. 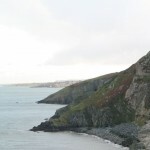 Really lovely walk on a sunny day I started at Greystones then at the cliff house went up on to the top walk for a fantastic view then continued on to the Bray cross on bray head then continued down the front of the head back down to the cliff walk. 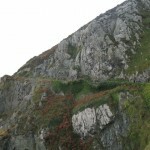 http://g.co/maps/wz98j – Google map marking path to cliff house. Hi, i walked along this route about halfway before realizing that we where past where we were heading(the cross on the hill) we found a path leading up the hill and followed it. We had to scale some rocks at the top and got back on a path towards bray handy enough. We are both in our twentys and not unfit( i smoke) it took us wbout 3 hours to do it and that was walking from the town centre and back to the car. I really enjoyed it and will definitely do it again. 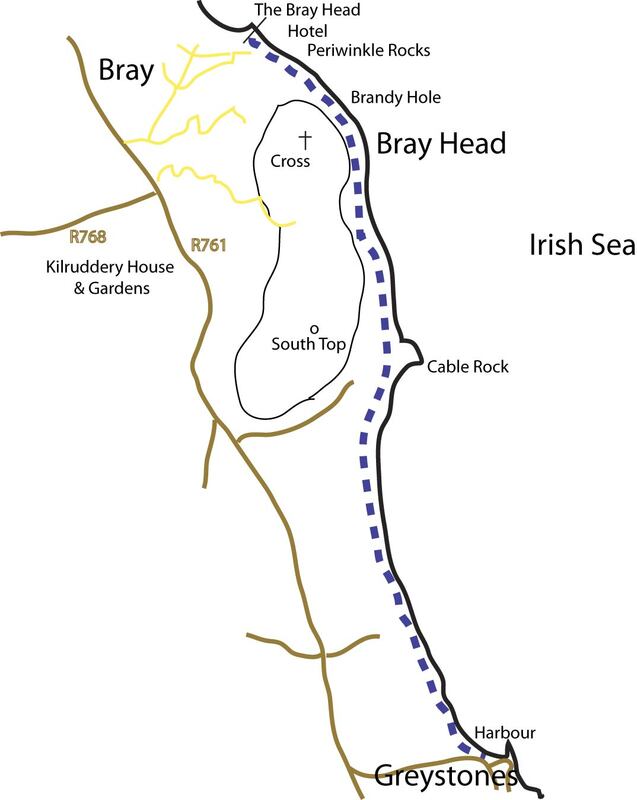 Hey, im just wondering if the walk up Bray head is safe enough at night and does anyone know some good area to shoot some night photography there. Walked this yesterday. 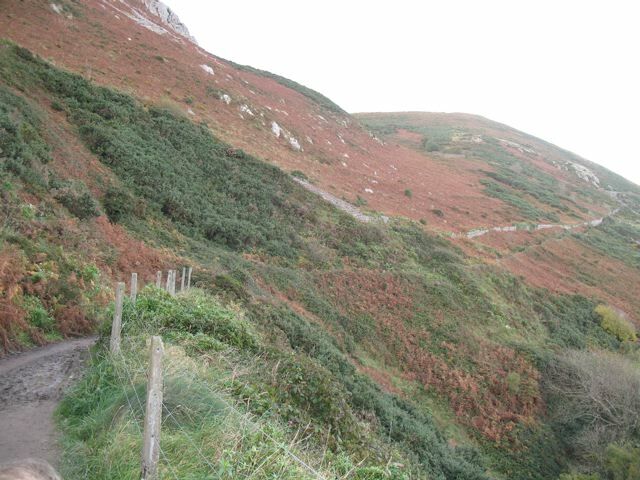 The path is fully open and the Greystones access is now tidied up and easier to find. 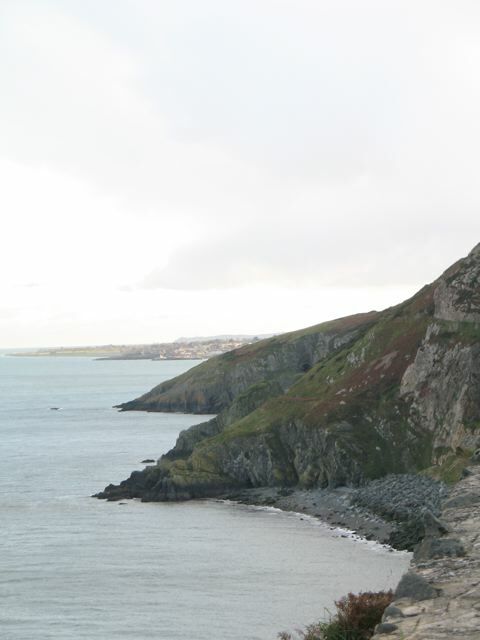 If starting from Greystones, it begins next to the fish and chip/cafe place almost opposite the pub mentioned above (forget the name – Harbour bar im guessing…) The start of the path is more inland and it’s a good while before you are looking out at the sea from the actually cliff. Lovely walk with lots of variety so. I love this walk, and generally walk both ways, after a stop in Summerviles for refreshments. Was considering doing this walk with a 6 year old and a baby in a pram, could anyone advise if it would be suitable please? Would be visiting Dublin soon and wonder if this path is open and okay to walk. Seven km is too much for me so I guess I can walk half and then turn back. I did this walk this morning starting in Greystones. It was a bright but cold morning. The visibility was excellent and the scenery was spectacular. I’m sixty-eight years of age and I had surgery last year. I completed the walk in about one hour and ten minutes, but I was glad to see Bray and the DART for a rest after the exertions. What a great feeling after it!!!! !